When in Tokyo, do as the locals do and you’ll be able to find local gems serving everything from marbled gyukatsu to casual kaiseki meals. On my list of popular local spots, Tsujihan is definitely my kaisen-don pick. A Japanese staple, kaisen-don 海鮮丼 is a hearty bowl of sushi rice topped with chunks of fresh sashimi. What makes Tsujihan’s kaisen-don particularly special is their so-called ‘golden ratio’ sashimi mix. As we sat around the L-shaped bar and watched the chefs mix together chunks of fresh fish topped with uni and ikura, the attention to detail that goes into creating one bowl is spectacular. Like all beloved Tokyo gems, Tsujihan is raved about on Tabelog 食べログ (Japan’s trusted review platform for all foodies), so don’t be surprised when you’re waiting in line with a bunch of Tokyo locals also vying for a seat! Note that Tsujihan only seats 12 at once. In general, weekend waits can be 1-2 hours long but on the weekdays, you may be able to slip in and out with Tokyo’s white-collared crowd much faster. A sashimi appetizer is served first–pro tip: don’t finish it all, it should be eaten at the end with your soupy concoction! Located in the backstreets of Nihonbashi, Tsujihan is a great spot for lunch before shopping through the surrounding Ginza area. When we arrived at Tsujihan for an early Saturday lunch at 11:30am, there were already 30 people ahead of us. After 1.5 hour (!) of waiting we finally managed to grab two corner seats in the small eatery. But the best things come to those who wait because the magic of Tsujihan starts when you’re comfortably seated with a cup of hot green tea in hand. As we quietly watched fresh bowls of kaisendon being made in front of us, we were first served a couple pieces of sashimi in a thick sesame dressing. Observing that other diners savored a piece before reluctantly pushing the rest to the side, we did the same (this is a Tsujihan tradition, save the sashimi appetizer for the end!). 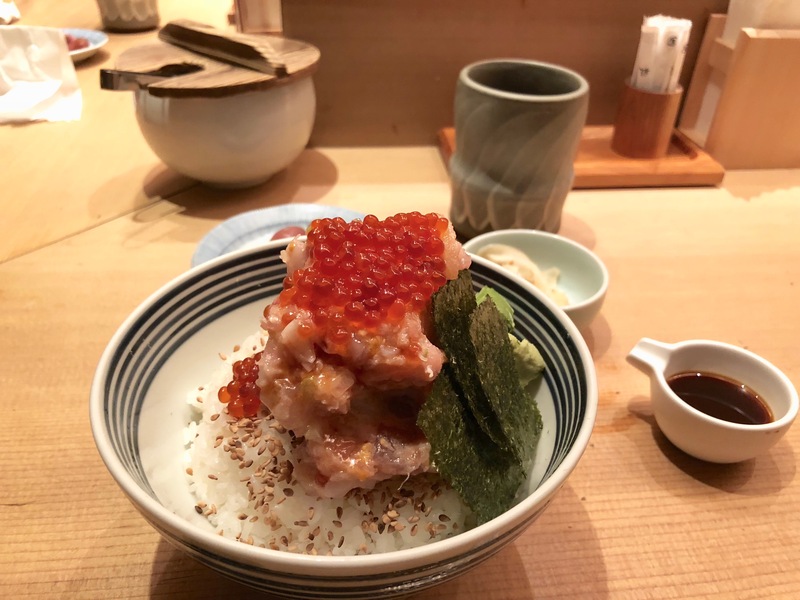 Next came the bowl of kaisendon and if ikura can be described as generously ‘smothered’ on, then that’s exactly what it was–a mix of seasonal sashimi chunks, topped with an incredible amount of glistening ikura roe, all resting above a bed of sushi rice with toasted sesame seeds. Murmurs of itadakimasu filled the room soon after. Half way through our bowl, the chef quietly offered to add a creamy dashi stock to our kaisendon. Upon passing my bowl to the chef, he gently stirred the simmering broth on the side before pouring some over my bowl. Now it all made sense, Tsujihan regulars tend to save the pieces of sashimi appetizer at the beginning so that they can enjoy their warm bowl of kaisendon with slightly seared sashimi chunks. The flavors that the added dashi stock opened up were completely different and such a delight. Tsujihan was a special find because I don’t find myself seeking out kaisen-don often in Tokyo, it’s either a sushi omakase or a deliciously deep-fried alternative. But after experiencing a bowl of Tsujihan’s specialty, I can’t wait to be back in the cozy restaurant watching the chefs top each bowl up with sashimi chunks. Thanks dear! It’s absolutely delicious, that broth they pour in afterwards is just out of this world. Yum! I really want to try this when we move to Japan! Please do! There are so many amazing local options in Japan, I love finding these tiny eateries even locals queue up for! I really want to go but with such limited time in Tokyo Im concerned about the wait, we are planing to go on a Monday around 2pm. Are there things that we shouldnt miss close to this restaurant? I see that Tokyo character street is close by (we like classic anime). Also, if you have to choose one ramen place around Shibuya or Shinjuku, which one would you choose? Thank you! Thanks for reading! If you have limited time in Tokyo, there are plenty of great places to visit without a big line. I highly recommend Ginza Sushi Marui in the same area for Kaisen-don (I’ve also blogged about it previously). Both are in Ginza, which is the shopping district. If you like classic anime, I heard Toei Animation Studio just finished renovating finally so you can always hop on a train from Tokyo station over!